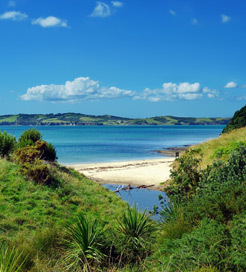 Motuihe Island is a beautiful recreation reserve situated in the Hauraki Gulf, just off the coast of Auckland in New Zealand. It has long been admired as a fantastic day trip destination, offering gorgeous beaches, excellent fishing sites and several large picnics areas. There is also a well-equipped campsite within walking distance from Motuihe Harbour in the northwest. Ocean Beach to the north has pristine sand ideal for sunbathing, whilst Wharf Bay on the opposite side of the isthmus offers great swimming conditions. Despite its beauty, the island has a turbulent history. It began as a Maori settlement but was purchased by Europeans in the 19th Century. It was then used as a scarlet fever quarantine from 1874 and as a prisoner of war camp during the First World War. The remains of the quarantine can be found in the western section of the island. However, over recent years, a number of volunteers and organisations, namely the Department of Conservation, have carried out an effective restoration project. They have successfully eradicated all animal pests and have planted over 160,000 flora specimens. A variety of native bird species were released onto the island as well, including little spotted kiwi, kakariki, saddleback and blue penguin, which has led Motuihe to become a top birdwatching destination. Sailing to Motuihe Island couldn’t be easier, with a high-speed ferry departing Auckland Harbour once a week. For more information, please visit our Ferries from New Zealand to Motuihe Island page.